Everyone says British food is bad, but nothing could be further from the truth. Every time I've been to Great Britain, I've had delicious food, even in the pubs. It's especially funny to me that Americans complain about British food. I think we Americans have the worst food on the planet. If I never go to another T.G.I. Fridays or Applebee's, it will be too soon. 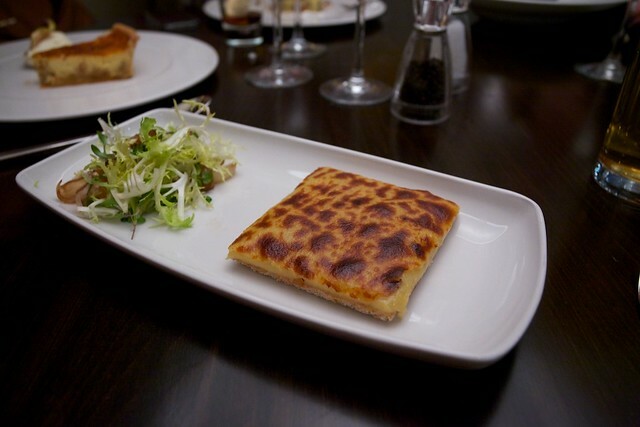 Welsh Rabbit, or Rarebit, as most people know it, is essentially a sort of open-faced grilled cheese sandwich. If you say “rabbit,” instead of rarebit, most people will correct you. Unless they are Welsh (like my step-father), or into etymology and know better. The original term was Rabbit, and was essentially an ethnic slur against the Welsh. “Rarebit” was the euphemism that people started using instead of saying “rabbit”. 1. Optional: Set the oven to broil. 3. Grate the cheese or run through food processor. 4. In a medium saucepan over low heat, melt the butter and whisk in the flour. 5. Whisk constantly for a few minutes, being careful not to brown the flour. 6. Whisk in mustard, optional Worcestershire sauce, salt, and pepper, until smooth. 7. Add optional beer and whisk to combine. 8. Pour in cream and whisk until well combined and smooth. 9. Add cheese a little at a time, stirring constantly, until cheese melts and sauce is smooth — about 5 minutes. Add optional cayenne to taste and add more salt and pepper if necessary. 11. Optional: Stick in the oven for a couple minutes, just until the cheese starts to bubble and begins to brown. You don't have to do this step but I think it really makes the dish. I would agree with your comment about Applebees and TGI Fridays. You can also include Chili’s, and Olive Garden. They are all one in the same. I can’t wait to try this recipe. It reminds me of a similar dish that a French chef would make for us employees occasionally. We had our choice of anything on the menu most nights, which was a special perk, but these cheese sandwiches were a melt in your mouth delicious! Throw in a spring mixed salad and it’s a great meal! I couldn’t agree more – British food is awesome! They’ve got such a lovely culinary heritage – truly rich and very nutrient-dense. What a refreshing and lovely thing to say about my adopted country! As an American now married to an Englishman and resident here for the past 11 years, I do tire of the “Britain has horrible food” stereotype … when in fact it’s not so bad! Meat here especially can be superb, and most British beef is at least partially grass-fed (there isn’t sufficient land space for US-style feedlot production!). Alas, TGI Fridays is here too … and many people think it’s wonderful. Ah well. I was born in England some 49 years ago. I lived there for a few years before emigrating here to the US with my parents when I was 7. I tell you this because the timeline is important. British food used to be horrible compared to American food. Everything was either boiled to death or fried. When I first came over here in the 1970s American food wasn’t GMO yet and feedlots were just taking hold. They had just started adding sugar and salt to everything but nothing had been supersized yet. The food was better over here and cheaper. As a working class family we could eat better for less money. Jump to the present and I had the pleasure of going back for a visit about five years ago and was floored by the food. I was there on business and working in the countryside of Wiltshire the heart of pig country. While driving around the countryside I would see cows, pigs or sheep roaming the grassy hills. And in one case a chicken farm where each chicken had staked out its own square foot of turf on a country hillside. All you could see were chickens as far as the eye could roam. All the food is local. Most is organic. All of it is GMO. All of it is free range. The food was terrific. I was there for three weeks and ate eggs and bacon and sausages every day. I lost weight and felt better than I had done in years. I am now very tempted to move back there just for the food. I’m wondering what a fantastic diet people have over there. It isn’t a struggle to get real food like it is here. Did you mean to say non GMO? When my husband and I visit Wales (his ancestors hailed from there) I make it a point to order this delicious comfort food. I make it at home and now I’m in the mood for it again. Nom nom!! I beg to differ re the state of British pubs – yes some are still in the dark ages however some like my favourite, a pub called The British Larder are top notch. Check their website out – I do so often for their amazing recipes. I’ve never tried this, but now I want to. As to the restaurants I would like to add Ruby Tuesday. Yuk! Oh, Antony will just LOVE this post! This is one my kids favorite lunches. :) I haven’t made it in a long time since my homemade bread tends to fall apart too much. In our house we call this English Rabbit and it’s our daughter’s favourite food. I do agree with you – American (and Canadian too!) food has got to be the worst. I’ve never been to visit England but if I ever go, I hope I get to try ‘real’ English food!